The perspective offered in this week's Gospel lesson is one that's always hard earned and too often, I'm afraid, comes to us late. I, at least, like the poor rich man in the story Jesus offers now, normally don't hold it. I'm still holding on, saving up, thinking I have forever. At some level, I know better, I do, but that hasn't necessarily translated into a daily awareness. Some time ago now I can remember spending the day with an old friend. She had recently been diagnosed with a rare physical condition. It sounded like cancer although they weren't calling it that. Unfortunately, her diagnosis had come late and by now it had really taken hold of her. The truth of this was hanging silent between us. Looking out the passenger side car window, out of the blue she said, 'I only wish I hadn't worried so much about money." It was true, she had worried a lot about her finances, I knew that. I didn't push it further though, for frankly I could think of nothing to say, although a kind question might have helped her to work it out more deeply. Indeed, these many years after her funeral I wish I had said something more. To do so, however, would have been to acknowledge the weight of the loss we both were bearing then and I wasn't yet ready. Instead I nodded and kept driving. As I reflected on these words this week, I was sitting on an airplane flying home to Chicago from Jackson Hole. I had spent the last several days on retreat at Yellowstone. They were good and rich days, whose learnings I will share on another day. It was as I was driving south out of the park on Thursday afternoon that I found I was struck, once more, by the utter beauty of it all, of course -- as much as I could take in for I was driving alone. For all the raw beauty of it though, from time to time I couldn't help but notice the not so beautiful stark stands of trees, stripped bare by fire in 1988. 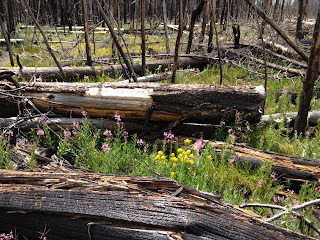 I'm told the fire burned so hot at times it stripped the leaves and the life from the trees and left the bare trunks standing before it moved on. In some places you can see new, smaller trees growing up to replace them. It's the natural order of things, of course, but 1988 was twenty-five summers ago! It was the year I was ordained a pastor and trust me, that seems like a long time ago when I measure the learning and the losses, the hopes realized and the dreams I alone have abandoned in that time. Only, twenty-five seemed like forever looking forward. Looking back, I get a little of God’s perspective on it all as it seems like just yesterday. And yet while I still recognize the young woman in the photographs from that summer I often feel I am not the same person at all. moment to pull off at one point to take a picture. I stepped off the road for just a minute into the midst of the bare trees and the charred limbs lying on the ground, these stark reminders of loss and change. And then I saw the flowers --- beautiful tiny yellow and purple flowers growing up in the midst of it. Life is returning to that bare landscape. In God’s time, life is returning. I offer this image now because twenty-five years seems like a long time. In God's eye, however, it is just the blink of an eye. My friend looked back on her life and realized the same. It had gone quickly and at least in some ways she regretted not living it as fully as she could have. Do you relate to the rich man in the story Jesus offers now? Why or why not? In your life experience, what brings this story home to you? Do you hear Jesus' story as judment or hope or both? Thanks for reading, Carla, and for commenting today. Blessings on your proclamation! I read your blog each week. I'm a midwesterner transplanted to Montana. I love your reflection about Yellowstone.